You can think of Alderfer’s ERG Theory of Motivation as a simplified version of Maslow’s Hierarchy of Needs. Whilst ERG Theory has much in common with the Hierarchy of Needs it does differ in a few important aspects. The model was developed by Clayton Paul Alderfer, an American psychologist. What is the ERG Theory of Motivation? The best way to visualize ERG Theory is in the context of the Hierarchy of Needs as shown below. As can be seen from the diagram, ERG theory is an acronym for Existence, Relatedness, and Growth. These are the three basic needs that employees will try to satisfy. In the model, as one need is filled, this will provide motivation for the employee to want to fulfill another need. All three needs must be satisfied simultaneously in order for an individual to feel motivated. Let’s examine what each of these terms means in turn. Existence refers to our basic survival needs as humans. In this category are food and water, shelter, good health, and feeling safe. These needs can be broadly described as our basic psychological and safety needs. If you can’t satisfy your basic survival needs then it impossible to focus on other, higher needs. For example, if you don’t have enough water to drink, and you don’t have ready access to clean water, then your life is in immediate peril and finding water will occupy most of your thoughts, at the expense of almost all other needs. Relatedness refers to our need to relate to other people, that is, it refers to the relationships we have. Having good relationships and interactions with other humans is a need we all share, although obviously, this need isn’t as strong as our basic survival needs. To feel happy and content most humans need to interact with others and for those interactions to be positive in nature. Growth refers to our need for personal development, to be creative and to perform meaningful work. Growth allows us to explore what our potential might be within our current environment. It’s easy to see why you might lack motivation if you are stuck doing the exact same job every day without variety. Conversely, if your job provides interesting and varied challenges, it’s easier to be motivated as you’re being presented with growth opportunities each day. ERG Theory proposes that if a higher-level need fails to be filled then a person may regress and seek to further fill lower-level needs instead. For example, if an ambitious employee isn’t provided with growth opportunities, then their motivation will be lower and they may become frustrated. This may cause them to seek out more relatedness needs. They may socialize with other members of the team more. Finally, if they are unable to satisfy their relatedness need, they may seek to further satisfy their existence needs. Unlike in Maslow’s theory, needs at multiple levels can be pursued at the same time. In ERG Theory, if a higher-level need isn’t satisfied then the person may regress to seeking to satisfy lower-level needs (Frustration-Regression principle). In Maslow’s theory needs must be satisfied in sequence from the bottom to the top of the pyramid, one at a time. This is not the case with ERG Theory, where different levels of needs can be satisfied at any time. For example, an individual can feel that they are having their growth needs met whilst still feeling unsatisfied in their relationships. Let’s now examine how the ERG Theory of Motivation applies to the workplace. To boost motivation, managers should look to promote all elements of ERG Theory simultaneously. 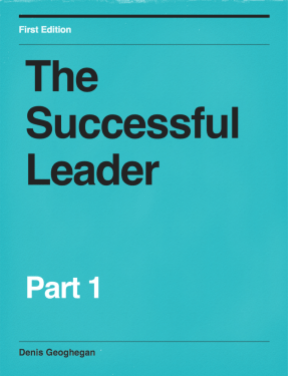 According to the theory, limiting your focus to just one or two aspects of the theory will fail to motivate your team. The aim is to act before Frustration-Regression starts to set in. Employees won’t be happy if their basic needs are not met. Rember that safety is one of these basic human needs. If employees don’t feel safe in their work environment they are unlikely to be motivated. Are you doing everything you can to make your employees feel safe? We all want good relationships. If we don’t get on with our boss it’s going to be difficult to feel motivated. Likewise, if we have negative relationships with co-workers then our motivation is likely to be low. We’ll look forward to leaving the office each day so we can get back to our homes and switch to having more positive relationships with our families. Are any of the team working isolated or working alone all day? In the workplace, we have a need to grow. If we work hard year after year and everything stays exactly the same we’re going to find it difficult to stay motivated. We need growth. This could mean recognition of our achievements, respect from peers, pay raises, increases in responsibility, or increased respect from peers. Do any of your team feel they are stuck in a dead-end job? Is each member of your team aware of the growth opportunities available to them? Do you tend to hire internal or external candidates for new positions? Preferring internal candidates can provide growth opportunities to your existing team. In the book, Good to Great by Jim Collins, Collins highlights how great companies share the trait of growing and hiring talent from within the organization, in preference to hiring external talent. 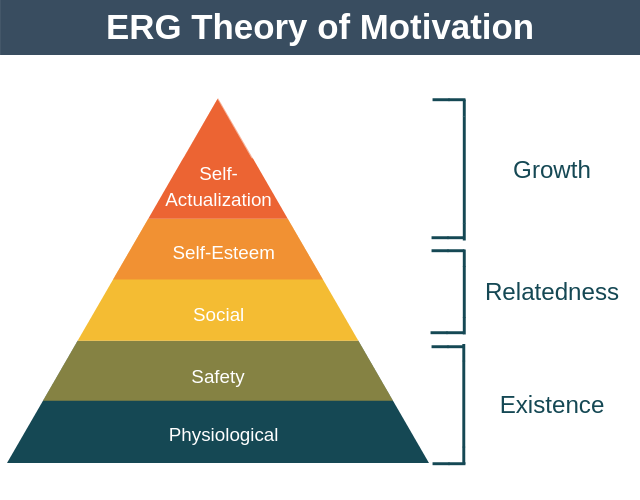 The ERG Theory of Motivation is a simplified but more flexible version Maslow’s hierarchy of Needs. It proposes three needs that must all be satisfied in order for an individual to be motivated: existence, relatedness, and growth. Managers can use the theory to ensure that the conditions within their organization are right to allow each team member to be motivated.